We’re advised to store what we eat and eat what we store by survival gurus. My problem with following this sage advice is that I no longer eat a Standard American Diet (SAD). Most of what is sold by long-term food storage companies goes against the grain (pun intended) with my eating habits and primal/paleo lifestyle. GMO wheat produced from the Industrialized Food Complex is the number one offender to my system. Sugar is my number two nasty. That just sounded awful. I’ll try to avoid turning this into an infomercial for Primal/Paleo living. I follow the 80/20 rule promoted by Mark Sisson in his Primal Blueprint. I do have cheat days where I eat a pizza and draft beer with DRG and friends – without guilt. My primal lifestyle isn’t a diet. It’s a lifestyle of taking my health into my own hands – making the connection between what I eat and how I live to how I function. If our hunter-gatherer ancestors survived and thrived without SAD meals, we can too. A little reprogramming is required. In any emergency situation, being in optimal health gives you a fighting chance to survive. In my Individual Preparedness Plan (IPP), my paradigm favors quality food over quantity. The more nutrients food contains, the less you have to eat. If you’re hungry 30 minutes after eating items from your cupboard, the cause may be that your conventional long-term food storage follows the USDA food pyramid. More and more people are waking up to this recommended eating disaster labeled “healthy” by our benevolent government. I personally eat the exact opposite of what the government tells me is good for my plate. With that out of the way, what do I add to my food storage pantry? I aim for a six months supply of food that’s fresh and high in nutritional value. Only 6 months? Yes. This reduces my need for storage space by eliminating all those buckets of GMO wheat, #10 cans of plastic cheese, Crisco that is one molecule away from said plastic, and sugar-filled drink mixes. I must admit, I bought a can of Crisco last week. Not for cooking, but to make an emergency candle. For cooking, I use tallow I render myself, coconut oil, butter and ghee, bacon grease, or lard. We’ll cover fats in a moment. It’s difficult finding foods that store well, are nutrient-dense, and primal/paleo approved. James, over at Survival Punk, posted a Top Ten List of paleo foods he stores. I plan on expanding his list with a few of my own. Remember, we’re individuals. This is my IPP. YMMV (Your Mileage May Vary). Even if you eat a SAD diet, try supplementing your larder with these items. It can’t hurt. I first heard of this tiny seed when I read the story of Tarahumara Indian ultra-marathon runners in “Born To Run” by Christopher McDougall. The ancient Aztecs called this seed “running food” due to increased endurance on long runs from a handful of chia. Spanish explores wrote that this ancient civilization valued this food more than gold. Hydration: Chia consumption contributes to maintaining balanced hydration and electrolyte levels within the body, steadying water intake, assimilation, and absorption. Now this item is right in my wheelhouse. For any sugar-burners still brainwashed into believing saturated fats are the cause of heart disease and obesity, put down your computer/tablet/fancy phone and walk away – NOW! What is about to follow will only enrage you and make you grab a can of high fructose corn syrup to ease your pain. I don’t want to contribute to your suffering. The unavoidable truth is that we humans prefer (physiologically) fat over carbs to fuel our bodies. Our genes came from fat burners. The obesity epidemic we face today comes from all the glucose released from the high carb wheat and sugar of the SAD. Eating good quality fat will hit the reset button on your genes. So what do I store to make my larder fat? Pemmican. Here’s my recipe. Prepared and stored correctly, it’ll last for years. My recipe included dried blueberries. For a better recipe, click this link. Again, this is for educational purposes only. Do your research and eat at your own risk. Coconut Oil. Excellent shelf life of several years. I eat it, cook with it, and “beautify” with it. Here are 160 more uses for this amazing fat. I use it on my skin after shaving my head and face. I’m using less in Novembeard. Ghee. Choose products that are made from quality butter. Making your own is cheaper. Butter contains 16% water and milk fat solids that cause it to spoil if not refrigerated. Ghee is almost pure fat and will last a couple of years in a dark, cool pantry. Fermented foods have sustained humans for thousands of years. When it comes to our gut flora, exposure to bacteria is a good thing. Fermented foods offer the sterile gut a healthy dose of probiotics to help balance our intestinal flora. In a prolonged emergency or TEOTWAWKI event, the skill of fermentation will become very useful – even life saving. Sauerkraut. Easy to make at home and full of probiotics. All you need is cabbage, salt, and storage containers. Here’s how I make homemade sauerkraut. Yogurt and Kefir. No, it doesn’t store well. So, find a local source for raw milk before TSHTF. With this milk, you can make your own kefir and yogurt. I buy raw milk for my “pets” at my local farmers market from time to time. Milk from a cow, goat, or sheep can be used. If you can’t get by the milk police, the “safe” homogenized variety will work. Coconut milk is another alternative. Acquire a kefir culture and you’re in business. Kombucha. From Mark’s Daily Apple: “Kombucha is a fermented beverage (fermented tea, to be exact), which means it can introduce beneficial bacteria into your body.” Action Note: On my list to make. To store these long-term (6 months for me), freezing is the best option. Electricity is needed. I’m studying other options of storing meats long-term (salt cured, smoked, etc.). As I mentioned earlier about finding local sources for milk, the same is true for meat and protein (eggs). I’ve got a local source for Water Buffalo 3 miles from my house. He told me he doesn’t raise animals, he raises grass. He’s a grass farmer. His grass-fed protein-on-hoof is just the by-product of his pastures. Eggs. I realize that finding true cage free eggs that are unwashed may be impossible for most. They’re worth the search for storage purposes. A local farm or neighbor’s backyard chicken tractor may be your best option. Be sure the protective, natural coating hasn’t been removed by washing. These eggs will store for several months in a cool space. Just wash them before eating. Protein in a can. I stock sardines and other fish since they have a long shelf life. Jerky. Make your own here. We can’t always have fresh veggies at our house. That’s when we dip into the canned stuff. Bacon. Yep, it comes in a can. For DIY’ers, try this procedure. Seeds for nutrient rich sprouts. This is a great use of the wheat you’ve got stored. Sea weed. Long storage life for minerals we need for health. Raw, Local Honey. Lasts forever and has so many uses. Salt. I like sea salt for our table and cooking. I buy other salt for different purposes and possible barter items in a collapse situation. Remember any wars being fought over this mineral? Raw Apple Cider Vinegar. It’s great for what ales you. I drink a mix of this, raw honey, and water a few times a week. Vodka. It makes a great martini and can be used for tinctures. Containers. Don’t forget these. Store a wide variety of mason jars, freezer bags/container, wax paper, etc. Teas. I sweeten mine with raw honey. There is no finish line in preparedness. Our best preps should focus on a sustainable, healthy lifestyle. Ditch the latest snake oil diet and try living a lifestyle that reflects our true, primal nature. Optimal health, functional fitness, knowledge, skills, and a Individual Preparedness Plan will go a long way in keeping us alive. I really appreciate you stopping by. Please share this with anyone who might find this article helpful. If you have any questions or comments, I’d like to hear from you. The next installment in the IPP series will cover what might be the most important, yet most neglected prep ever. I am new to your website. I have been looking around the internet for information about preparedness for paleo-like diets. There is very little information on the topic and I have been considering a winter project on the topic. That was a frightful picture of canned bacon! The thought I couldn’t get out of my mind was how the bacon would be contaminated with the chemicals used in making wax paper. Ugh! Thanks for stopping by and commenting. 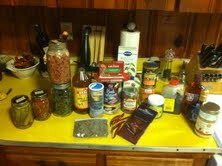 Primal/paleo preparedness is what I’m attempting to build. You’re right. There’s little written about this subject. I’m looking forward to your thoughts in your winter project. Really like what you are doing in BC! I’ve kicked around the idea of creating a local food co-op with some teachers I work with. It would start very small to gauge interest. BTW, love the kale chips on your site! Great crunch, tasty, and just plain good for you. Yeah, I never thought kale could taste so good. If you are looking for a really good primer on starting a buyer’s club please see this Weston A Price Foundation essay by John Moody. Unfortunately, the WAPF website appears to be down again. They have been having regular hacking attacks over the last few months. Try searching for “John Moody” after their website comes back up. DO NOT enter the website during a warning. Malware. Do be careful. Food can be a dangerous political issue as I have found out from watching what has happened to other people that have tried to provide quality food for others. I found that article by John Moody. Thanks! He offers great insight into starting a buyer’s club. Seems pretty daunting. I guess starting small is the way to go. John Moody also has a ebook on starting a buyer’s club. Did you see it on his website? Thanks for the links Caroline! Very helpful in my ongoing research to start a food coop. I’ve got a little time off this week from school and plan to contact some local farmers from our area. I’ll keep you updated and pick your brain for more info. Pingback: How Many Pills Until Pharmageddon? Caroline, I really enjoyed browsing around your blog. I subscribed via feedly! I was just on your blog reading about sorrel. It’s a wonder of our time that we can share with people from around the globe. I’ve learned so much from you wise people. I am truly blessed. Yes! I did — excellent post! Glad that I re-read your post and saw her comments — then followed her links. Oh, I saw that kombucha is on your to-do list. If you cannot find a free scoby and you’d like a free one from me, just send me an email. It is super easy once you have learned (just a few no-no’s that you must be mindful of). Todd, you are seriously my favorite blogger! This post is so relevant to me and my family! We’ve stopped buying wheat and beans for our storage plan. I’ve moved to, as you know, learning wild edibles as part of our food plan (the earth and plants store the food for us 🙂 ). But, for sure, we have shifted our focus to what you have written in this post. You need to stop, Crunchy Mama. My ego is going nuts. Seriously, thank you! I’m humbled. Since going primal, I’ve had a hard time trying to figure out what to store and how to make it last. Hunting and gathering is totally an option if you know what to look for. The one draw back is that there will lots of H/G in a collapse situation. Again, you made my day! Two years later – any additional thoughts, resources, food sources you use for your storage preps? have yall tried canning whole paleo meals? or pressure canning? Hey Tex, good to hear from ya. We do some canning, dehydrating, jerky, etc. It’s hard to store what you eat when you’re paleo, but we’re finding ways to do it. Humans are omnivorous. Our distant ancestors ate whatever they could to stave off starvation, including wild grains. Grains, sugars, dairy & legumes aren’t any more bad for us than saturated fats. The key is moderation. I’ve read many paleo publications. They demonize grains, sugars, dairy & legumes. Yet, anthropologists are discovering just how varied & all inclusive the ancient human diet was. They are finding starch grains & the pollen from plants that are carbs, in the dental plaque of ancient human fossils. I think that limiting our diet, in whatever way, to a narrow range of foods is as dangerous to human health as monoculture is to a population that doesn’t grow its own food any more… In other words: If you can safely eat it, eat it.